Dollar is located in Scotland's smallest county, Clackmannanshire. 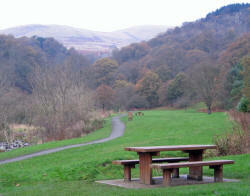 It nestles under the slopes of the Ochil Hills. The estimated population in 2010 was 2,970. The picture opposite is a view of the town from Bank Hill. 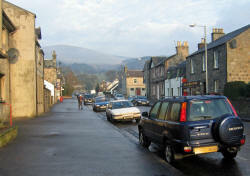 The town's main street, Bridge Street (left) is part of the A91 Stirling to St. Andrews road. Most of the town's businesses and shops are located here. 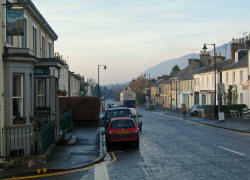 The photo on the right is Station Road with the Ochil Hills behind. The railway was closed to passengers by Dr. Beeching in 1964. Two views of the Dollar Burn. Taken in the spring, the photo on the left shows the cherry trees which line the banks of the burn in full bloom. Visit Dollar in May to see this. The other shows the Christmas lights which brighten up the town during the long dark December nights. 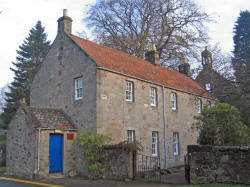 The Old School House (left) was built in 1640. Initially the local minister was the teacher, but later a lay schoolmaster was appointed who lived in the top flat and the children educated on the ground floor. The oldest part of Dollar is centred on High Street in the north west corner of the present town. The photo opposite shows some of the oldest properties on Hillfoot Road. The Castle Campbell Hall (right), which now houses Dollar Museum, was built by William Drysdale in 1820, as a woollen mill. In 1865 it was converted into a meeting hall and was known as the Volunteer Hall; it was used by the Volunteers as a drill hall. After the Great War it became the headquarters of the British Legion. Latterly Dollar Academy used it for classrooms until 1991. 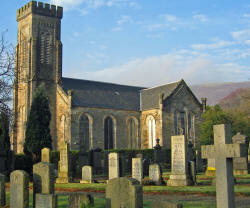 The present parish church (left) was built in 1841 during the ministry of Dr. Andrew Mylne. It was completely renovated and rededicated in 1926. 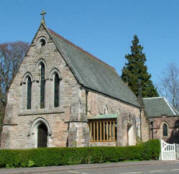 The Scottish Episcopal Church of St. James the Great (right) was completed in 1882. It was designed Thomas Frame of Alloa. 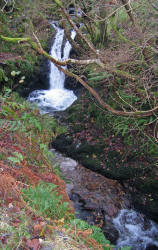 Lying to the north of the town The Glen starts at the Mill Green which was the town bleaching green. A clean up project to commemorate the Silver Jubilee was completed in 1979 when Princess Anne visited Dollar. The path shown in the photo was completed in 2004 as the Community Council's Millennium Project to provides disabled access. Castle Campbell at the head of the glen was formerly the chief lowland stronghold of the most powerful of the Scottish Clans. It is thought a fortress has stood on the site since Norman times. 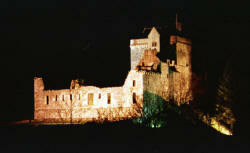 It was known as Castle Gloume and was owned by the Stewarts of Lorne. The present building dates from the 15th and 16th centuries. It is now owned National Trust of Scotland and maintained by Historic Scotland. Dollar Academy was designed by William Playfair. Building commenced in 1818. The school was founded by John McNabb, a local boy who made his fortune in shipping. On his death in 1802 he left half his fortune to the parish to build a school. The school currently has a roll of 1230 pupils and is the largest employer in the town. The new Maguire Building, completed in 2005, is considered by the Civic Trust to be the most significant building to be built in Dollar since the original school.